Copy and paste is one of the most common actions in Windows PC and if you are looking for a utility that can help you maintain multiple clipboard contents with simple hotkeys combination, here is a free utility that may fit your need. Named as ClipCycler, it is an open source clipboard utility that allows users to cycle through a number of clipboard contents, lifting away current limitation of a single clipboard content which is no longer sufficient especially for power users. Once download the utility, just launch the .exe executable file and you are ready to use. For the start, users will need to define or configure the hotkeys combination (for instance: Ctrl + Tab keys) to either cycle forward, cycle backwards so that the method can be effectively used depending on own preference. Besides, there is also a way to switch between Hebrew and English language, as well as completely remove or clear the clipboard contents at any time. 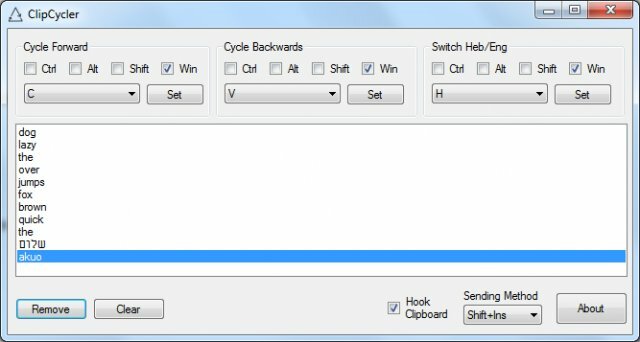 Consumed at merely around 500kB of your hard disk space, ClipCycler is free for download and is compatible with all 32-bit Windows Operating Systems. The only pre-requisite is users will need to install NET Framework 3.5 for it to work correctly.